Congratulations! You've created a kickass Facebook Ad. You've designed it, targeted it and are tracking it to hell and back. It's being tested and it's sending people to a landing page optimized to receive them. You're not quite done, though. In fact, you're just getting started. This chapter will break down exactly how you can turn your Facebook Ad traffic into customers. If you're an ecommerce or B2C company, you can skip ahead to the Conclusion and Related Reading of this guide, as your Facebook Ad adventure is pretty much over. If, on the other hand, you have a longer sales cycles or are going to need to nurture your Facebook Ad traffic into leads and sales, stick around and I'll give you a step-by-step walkthrough of how you can do that. 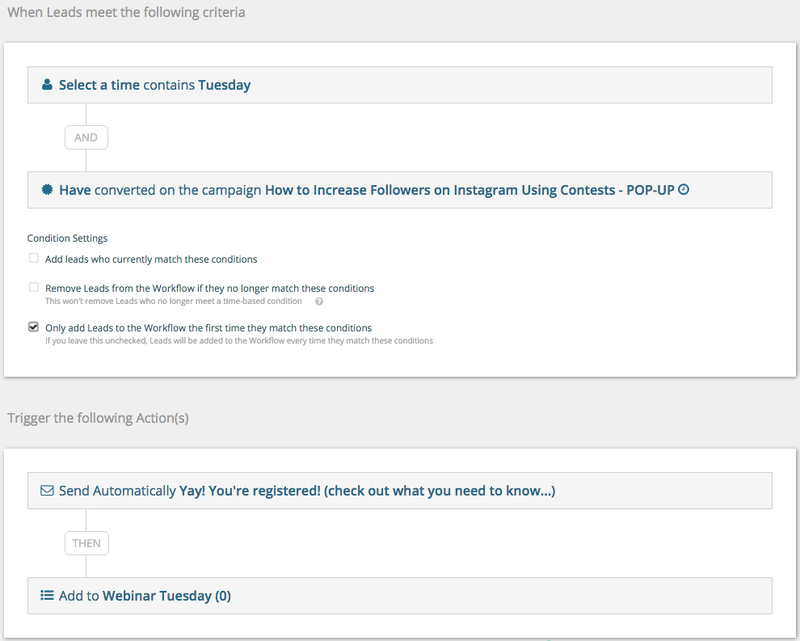 Let's use an example from Wishpond's own sales funnel: a webinar teaching people how to increase Followers on Instagram. Using Facebook Ads to drive traffic to this page is a good strategy: Facebook Ads allow you to target professionals who have stated their interest in your webinar's topic (no matter how specific it is). You can also target people in specific geographic locations to maximize the chance of a registrant actually attending your webinar. On the left side you're seeing the LP itself, and on the right you see the click popup which is triggered when a visitor clicks on the "Reserve my Spot" call to action button. Wishpond has found that click popups like these (rather than a form directly within the landing page) convert better. I've also zoomed up on the "Select a Time" options on the popup. These will be vital when it comes to increasing webinar attendance in the next step. For more on using click popups within your website, and how we've usd them to double subscribers, check out my article How We Doubled Lead Generation with Click Popups. Once you've generated your webinar lead, you need to push them to actually attend the webinar (otherwise you've lost them before you ever really had them. The depressing statistic about webinar attendance is that only about half of the people who sign up for your webinar will actually come to it on the day. Essentially, this simply says that all leads who chose "Tuesday" as their preferred webinar date AND converted on the popup will automatically be sent a "Yay you're registered!" email thanking them for registering and giving them some information about the upcoming webinar. They're also added to the "Webinar Tuesday" leads list, which comprises every webinar registrant who signed up for that specific day. This allows you to segment your communication and emails effectively. For a complete guide to lead and customer segmentation, check out The Complete Guide to Lead Segmentation. 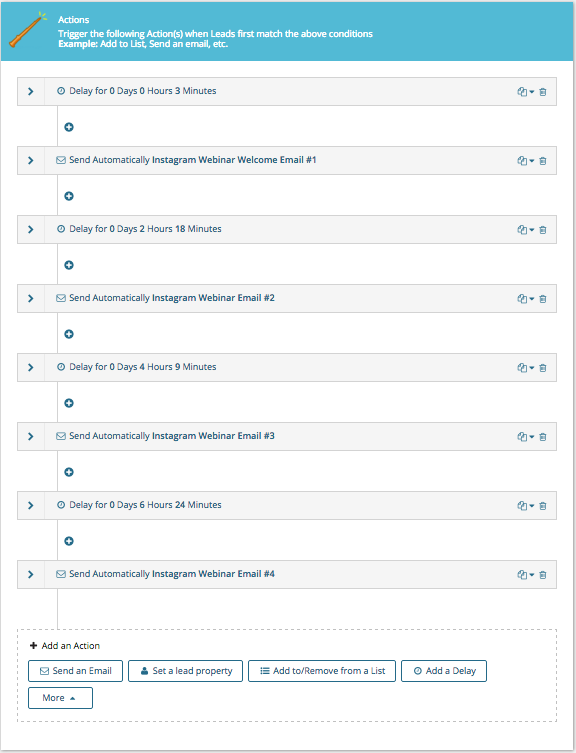 So you run your webinar and maximize the chance of someone actually attending it with segmented communication. Everything goes well and, because of Facebook Ads, you're happy with the number of leads you generated. Now it's time to get your money's worth. Everything has been leading up to this point: your Facebook Ad campaign, targeting, testing, tracking and the entire creation of your landing page. The most reliable way to turn SaaS leads into sales is a combination of a custom audience Facebook Ad campaign and a marketing automation lead nurturing drip campaign. Let's quickly break down the Facebook Ad campaign first. 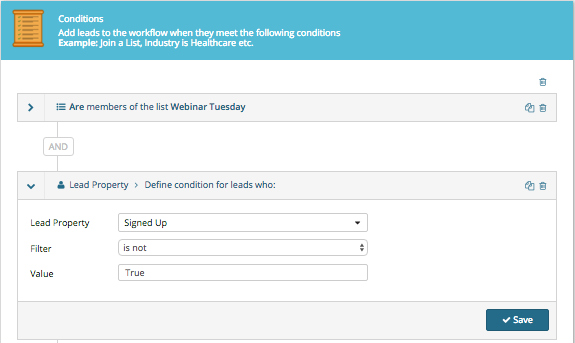 Step #1: Export your webinar attendees list and upload it to Power Editor as a CSV. Step #2: Create a custom audience. Step #3: Create a Facebook Ad based on your business' ability to help people find success with your webinar's topic (in the case of the webinar above, the Facebook Ad headline might be something like "Wishpond's Instagram contest app is proven to give you Followers.") Feature your logo prominently, as they'll recognize it from the webinar, and this will attract their eye. Step #4:Create a signup page specific to this campaign within your website. Consider a discount offer. Now, this campaign may be enough to drive your webinar attendees to signup by itself (and cost you very little), but a little insurance never hurt anybody. Step #2: Set the actions for your workflow. In the example we're working with, it'd be "THEN, deliver a series of four emails (over the course of a week or so) built around communicating the value of Wishpond's Instagram Contest App:"
As soon as anybody did signup, either because of an email or the Facebook Ad custom audience campaign, they'd be automatically removed from this workflow (because of the condition "has not signed up").